First and foremost I am Gia from www.giasaysthat.com which is a style blog featuring my personal style.Today i am going to be featuring some of my outfits corresponding to the latest trends and these are some of my favourite pieces from my wardrobe. -Bright shirts to add a pop of colour. 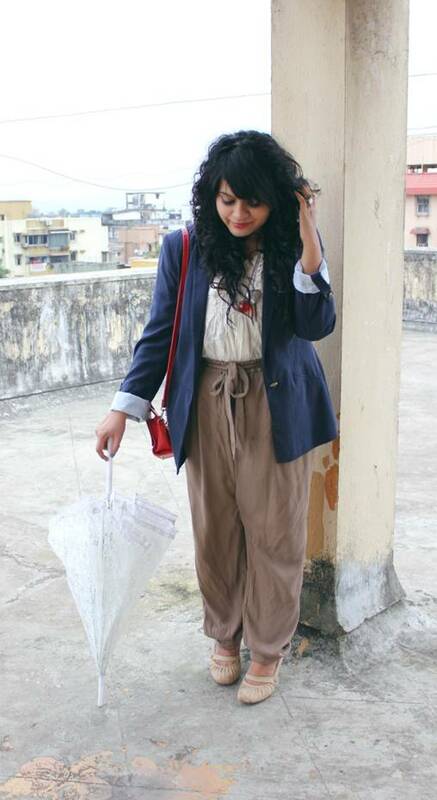 I would love to start it out with this outfit.Here i am wearing a Zara Blazer,Shirt from Colaba causeway and Trousers from Asos.High waisted trousers are flattering to any body shape.It might make you look a little shorter but make sure you pair them with heels. 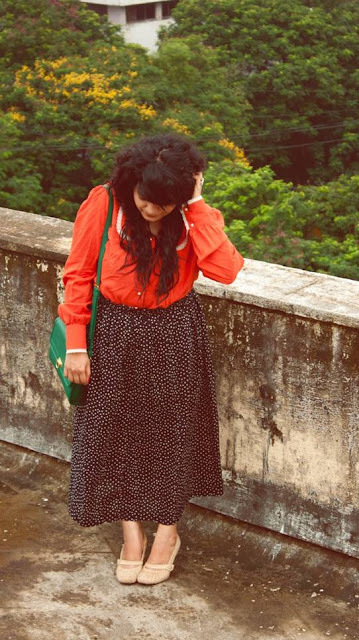 Here i am wearing a bright orange/rust shirt from asos.com and a polka dotted skirt from Colaba.Polka dots are big trend and for this fall/winter the polka dots are going to bigger & better.The bright orange shirt adds a pop of colour to the outfit . Lace is extremely feminine.You can toughen the look up with a gold chunky chain .I love lace and this dress is from dorothy perkins .To make it look less girly and more edgy/quirky,you can wear a Black lace shirt with high waisted denim shorts. 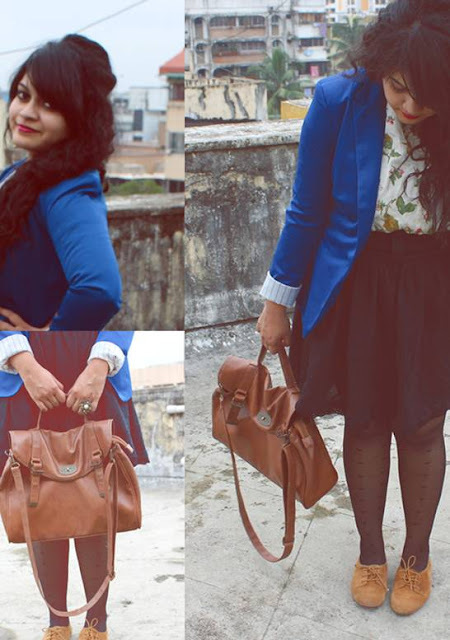 Here i am wearing the Adelaide blazer from shopatgiasaysthat.com ,floral topshop shirt,skirt from colaba and Suede brogues from Zara. awesome ones gia..loved the lace dress and blazer.. The lace dress is really pretty!! I love the lace dress and the electric blue blazer! Is dorothy perkins here in India yet? 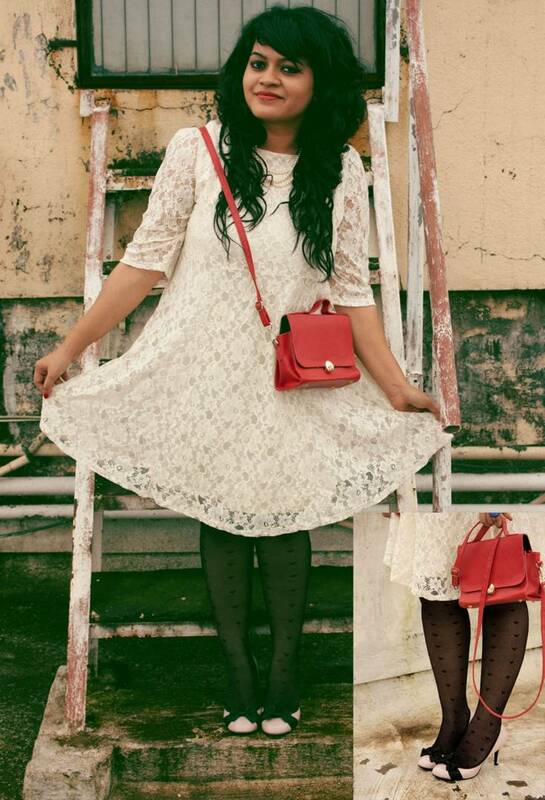 I'm a huge fan of white lace too and love that dress on you! Also your hair is gorgeous. What an exquisite cut and style. 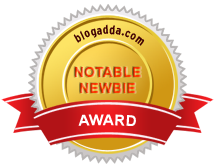 I like your style.And nice blog.Thanks for sharing. I find many more offers at jabong offers at Grabon India.